The large trophy line has a variety of 2 column, 3 column and 4 column trophies. These tall trophies are perfect for championship tournaments. These championship trophies will give the winners true braging rights. 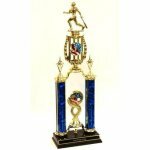 Large tournament trophies are a great way to attrack teams to your tournament. The large trophies are also great for team members to commemorate a truely successful seaon. Of course, car shows and other motor sports love to give out large trophies that can be displayed for years to come. LARGE Selection. FREE Engraving. Need an victorious football championship trophy? 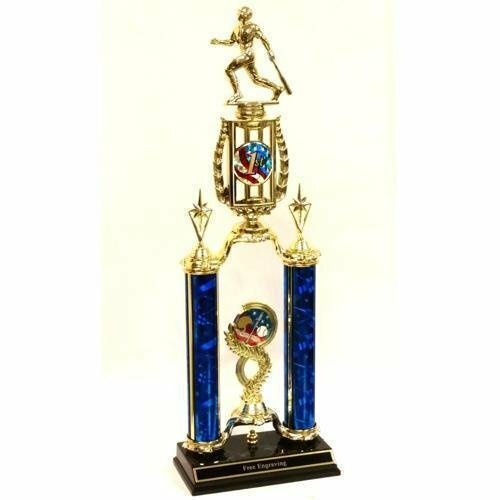 Whether you call it a large trophy, tall trophy, big trophy, 2 column trophy or 2 post trophy, you are sure to find a wide selection of championship trophies. These large trophies make great football awards. The big trophies, also known as 2 post trophies or 2 column trophies, have a lot of character. For tall trophies, these football trophies are economically priced. The football award is available in several sizes. When you specify the height of the football trophy, the columns will be increased as needed. Free shipping is available on orders over $100. Free engraving is always included. Height Shown: 23" Available Heights: 20" - 25"
Need an 3-post championship trophy? Whether you call it a large trophy, tall trophy, big trophy, 3 column trophy or 3 post trophy, you are sure to find a wide selection of championship trophies. These large trophies make great awards. The big trophies, also known as 3 post trophies or 3 column trophies, have a lot of character. For tall trophies, these trophies are economically priced. The award is available in several sizes. When you specify the height of the trophy, the columns will be increased as needed. Height Shown: 24" Available Heights: 24" - 42"
No one will be left with any doubt as to who the winner of the tournament with this incredible 3-Post Tournament Trophy. Additionally, the eagle Mylar holder in the center hold a Mylar to fit yours needs. The wood three post base is in a triangle shape and has plenty of room for any of your recognition and personalization needs. This award trophy measures 29" tall. After you have added this item to your cart, you can modify any of the parts for any sporting or academic activity. Your recipient wont believe their eyes when they see this award trophy! When you specify the height of the trophy, the bottom columns will be increased as needed. This championship trophy has a beautiful metal cup on top. This championship award has 4 marble finished plastic columns sandwiched between a black wooden lid and base. The award base is personalized with a a black brass plate with a laser engraved gold border and lettering. This 4-Post Tournament Trophy is very impressive. This award trophy measures 32" tall. After you have added this item to your cart, you can modify any of the parts for any sporting or academic activity. Your recipient wont believe their eyes when they see this award trophy!